It’s been a while since I had a chance to do any pinups, so I thought I would test drive this awesome new Ring Ring Pinup Pose set from Ilona & outoftouch to get back into the groove. Really nice poses and comes with some cool props. I thought it turned out rather nicely, don’t you think? There has been a lot of personal and career stuff going on these past few months so it’s been really hard to do any art, but I think I’ve exorcised the demons for the time being and will be getting back into the swing of things. I also have had a couple book offers that I am contemplating. Maybe I’ll be in print soon? I think that would be pretty cool and motivating. More coming. WOW! 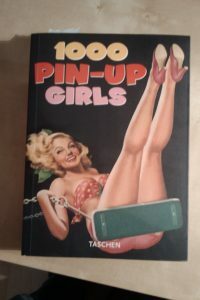 I was flipping through my favorite pinup book Taschen’s 1000 Pin-Up Girls and I found this magazine cover with the exact same pose as the image above. I guess this must have been where Outoftouch got the inspiration for that pose set. Pretty spot on actually. I LOVE that book by the way. If you’re looking for some good pinup motivation, I would definitely suggest picking it up.